November is here which means that the holiday season is just around the corner - it's hard to believe but Thanksgiving is a mere two weeks away! The holiday season, and especially Thanksgiving, is enough to produce mass quantities of anxiety in anyone. Add gluten-free diet requirements to the mix and you may need to keep some anti-anxiety meds handy. Thanksgiving doesn’t have to be a gluten-free nightmare, though. Thanksgiving can be whatever you want it to be – just check out Shauna’s (aka gluten-free girl) brilliant post on the topic. For most of though, Thanksgiving is the day we battle it out with gluten-laden tradition. To help you out this Thanksgiving, I will be doing Thanksgiving-themed posts from here until the big day. Now that the food is covered, here are some tips that helped me survive my first gluten-free Thanksgiving last year. 1. If your family needs some guidance about what gluten-free diets require and what they are all about, have them check out this post about gluten-free living and also restaurant navigation . You should have them pop on over to Gluten-free Goddess and check out her ABCs of gluten-free dining. 2. If you are dining with someone new or people not well versed in gluten-free dining, give them a call or email and talk to them about your requirements. You can refer them to several online lists which list out what is/isn’t safe for gluten-free diners. 3. Offer to bring a side dish or two, that way you know you can eat at least two things safely plus, you can surprise everyone with how delicious gluten-free food really is! 4. Stick to the basics such as turkey, mashed potatoes (without gravy), and roasted vegetables. There are plenty of things that are naturally gluten-free at the Thanksgiving table. If you’re unsure, always ask – better safe than sorry! 5. Start some new traditions by trying out different foods that are gluten-free. Living a gluten-free lifestyle is a collaborative effort that affects families, spouses, and friends so why not celebrate it by starting some new fun food traditions? One new tradition you can start? 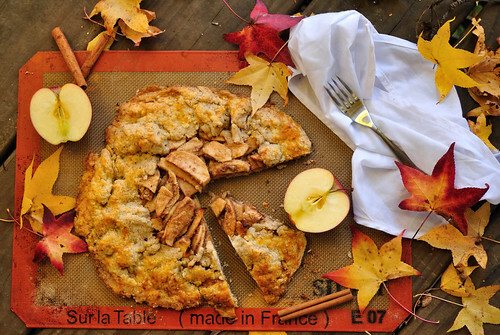 Trade in apple pie for an apple crostata. A crostata (or galette depending on if you’re feeling Italian or French) is simply a free-form pie filled with whatever your heart desires. I love crostatas because they are simple to make and their rustic shape is perfectly charming around the holidays. I think the rustic shape shows the love and warmth that is associated with Thanksgiving. If pies are perfect fall boots, then crostatas are that cozy warm sweater that you have had for five years. There is no worrying about fancy edges or laying on the top crust ever so perfectly. They are just delicious little rustic pies brimming with cinnamon roasted apples and kissed by maple syrup. So go ahead and try out a new tradition around your Thanksgiving day table. 1. Make your pie dough and refrigerate. Take it out about 15 minutes before your are ready to roll it out. Preheat your oven to 425. 2. 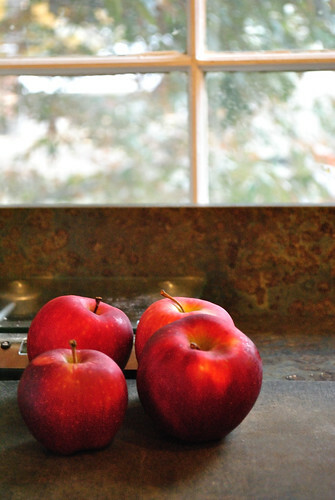 Thinly slice your apples and toss in a large bowl with lemon juice, 2 Tbsp. maple syrup, and vanilla. 3. Combine flour and spices in a separate small bowl and add this to your apples. Gently toss to coat all the apples. 4. Roll out your dough into a large but substantial circle (about 15 inches). 5. Place apples in the center of the dough, leaving about a 2-3 inch perimeter about all sides. 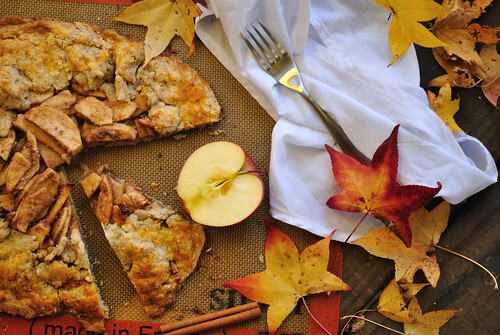 You may have some leftover apples, it depends on how large your dough is. If you have leftover apples, roast them. Trust me. 6. Fold perimeter dough up towards apples. You can pinch portions to make a fluted look or just leave it be. Up to you. 7. Brush dough with egg and pop in the fridge for another 30 minutes to make sure everything is cold. 8. Bake at 425 for 15 minutes then drop heat down to 375 for another 30-45 minutes until the juices are thick and bubbly. 9. Let cool for 5 minutes before slicing and drizzle 1 Tbsp. of maple syrup over the hot apples.